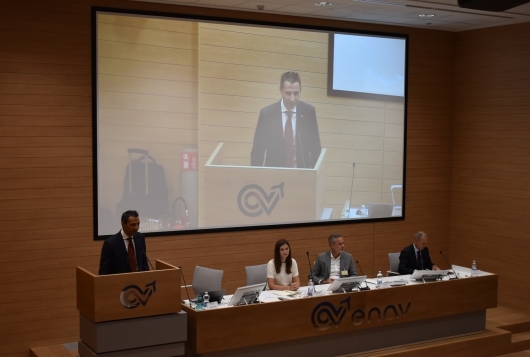 The final event of the BLUEGNSS project was held on July 18, 2018, in the splendid setting of the Auditorium of the ENAV Rome Ciampino premises. About fifty representatives from the Consortium formed by the four ANSPs of the BLUE MED FAB (ENAV, leader of the Consortium, the DCAC of Cyprus, HCAA of Greece and MATS of Malta) and the industrial partner IDS Ingegneria dei Sistemi, along with delegates of the Italian NSA ENAC, of some airlines and International Trade Unions and Professional Staff Associations, gathered for an afternoon dedicated to presenting the statistics, performances, activities and benefits expected from the implementation of the project. The BLUEGNSS project, 'Promoting EGNSS Operational Adoption in the BLUE MED FAB', started in January 2016 and closed last June, aims to promote innovation technologies to maximize the potential of European GNSS and its adoption in civil aviation.